Mormon Mommy Writers and Friends: Is a Picture Worth a Thousand Words? The work and collaboration that goes into creating a comic book or graphic novel is astounding. Not only must the author have a clear idea of what they want, they must articulate it in a way that an illustrator understands. In traditional reading, if the author leaves out details, our minds fill in the blanks. A graphic novelist and the illustrator must team up to give the reader a complete picture. I have a friend who has done just that. He wrote a story, found an illustrator who enjoyed and believed in the story. Now they have a complete comic book ready to be published. Of course, they have to go through the same rigorous publication process as traditional book authors, but I believe they can do it. Now for the million dollar question: do graphic novels and manga hold a candle to traditional books? In my humble opinion, I think graphic novels and manga are amazing. It’s a different way of storytelling that combines art with words. Will they ever truly take the place of regular novels? No, but that doesn’t mean they don’t have value. Looking at it from a teacher’s perspective, graphic novels are an attention-grabbing way to introduce reading to kids who struggle with traditional books. Graphic novels also introduce a visual aspect to reading that will help those who prefer to learn visually. In this light these graphic novels provide a gateway into the literary world. I have read quite a few blogs and forums that bash the use of graphic novels and manga in the classroom. They acknowledge the fact that it does entice children to read but contend that the content of graphic novels and manga are unlikely to really stimulate higher thinking. They argue that pictures are already there in front of the student, thwarting the readers’ use their imaginations to create the scenes and characters. Another criticism is the restricted point of view in a graphic novel. Standard novels have a variety of viewpoints: allowing the reader to see into the character’s mind, to feel what one or more characters is/are feeling, to understand what they are thinking, or to be totally mystified and surprised. On the other hand, graphic novels usually (not always) have a third person omniscient point of view. To some readers, it seems as if graphic novels are constrained. I will admit that I love the way my mind can create an entire world just by reading a series of letters printed on a page. It is a type of magic that only novels possess. On the other hand, graphic novels have their own type of magic. They are usually quicker paced and read just like a television episode plays. We get to see the different characters, put names to faces and enjoy their subtle facial expressions. Graphic novel writers can introduce complicated plot lines without too much confusion. Plus the artwork is amazing and powerful. I mean, just look at this! Also, writers of graphic novels can explore hard -hitting subjects such as drug abuse, loss of a loved one, and war in a real and tangible way. 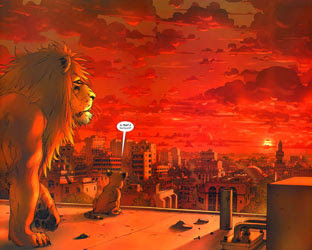 The lion picture above is from a graphic novel about a pride of lions that were in the Baghdad zoo. Due to the war in Afghanistan, bombs were dropped in April 2003, destroying the zoo, particularly the cages housing the lions. Suddenly the lions are faced with freedom and a war they don’t understand. This is actually based on a true story, and I recommend this to teen and adult readers who want a different point of view of the war in Baghdad. It is a beautiful and heart-wrenching story that the author and illustrator brought to life through a combination of their words and art. There have been numerous research studies done about the benefit of using graphic novels in the classroom. One such study was done at the University of Oklahoma, which showed that graphic novels may improve memory and be more effective in teaching than traditional textbooks. Participants in the study were divided into two groups. One group received information from a traditional textbook while the other group got to read about the same information constructed into a short narrative in the form of a graphic novel. After reading, the participants were given a short quiz over the presented material. Low and behold, the participants who read the information from the graphic novel were able to recall a greater amount of information, including direct quotes! If you would like to read more on this study, follow this link. This is just one study out of many that shows the benefits of graphic novels. While I don’t think that graphic novels will take over the literary world, I do believe they have a valuable spot on our shelves and the shelves in schools. Whether we think of them as a gateway for further reading endeavors, or as a tool for comprehension, it is hard to deny the worth of this type of writing and the impact it has on readers. What do you think? Would you allow your children or students to delve into the world of graphic novels and manga? Do you think graphic novels hold the same amount of literary worth as traditional novels? Let me know what you think! Love the discussion. But. . .How is a graphic novel different from an old time comic book? A picture is worth a thousand words but let us not forget the thousand words. Words can be used to describe smells, sensations of touch, thoughts within minds. What good is a novel if it does not cause a tear in the eye, a smile on the face, a bit of anger... ? A novel is not just a story but an emotional experience. Reading should also build vocabulary and complex sentence structure. Speaking in one syllable words and short sentences is not the mark of a well read person. Alex, you have provided an interesting topic for intellectual discussion. Perhaps others will add their views.